Missi Puri and I simply love it. Yummy yummy in my tummy :-). Many a times or rather most of the times I eat it hot as it is, atleast one. Puri’s are generally made in Indian household when there is some function or some social gathering. It goes with all. Pair it along with chole , kheer, Aloo Saag or whatever one likes. The beauty of this is that it is quick to make and one can make it ahead of time. (Although garama garam ka mazaa alag hi hain). 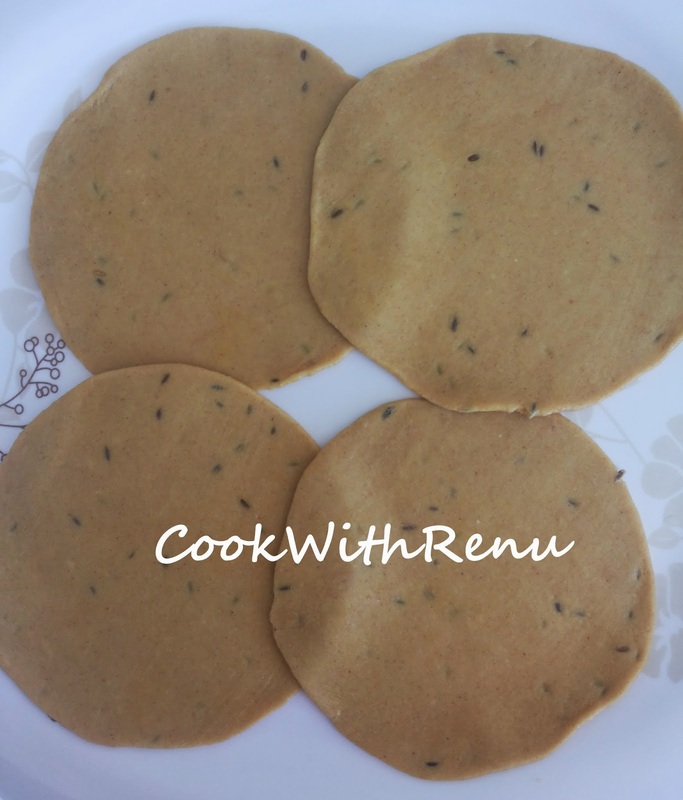 Puri’s can be made sada (i.e. only wheat flour) ,of palak (spinach) ,of Beetroot or whatever one wish to. Add the Ata, Besan, Jeera, Haldi, Asafoetida, Oil and salt in a bowl. Give it a quick mix so that the ingredients mix well together. Now knead the dough by slowly adding water. Do not add too much water at a time. We want a stiff dough and not a soft dough. 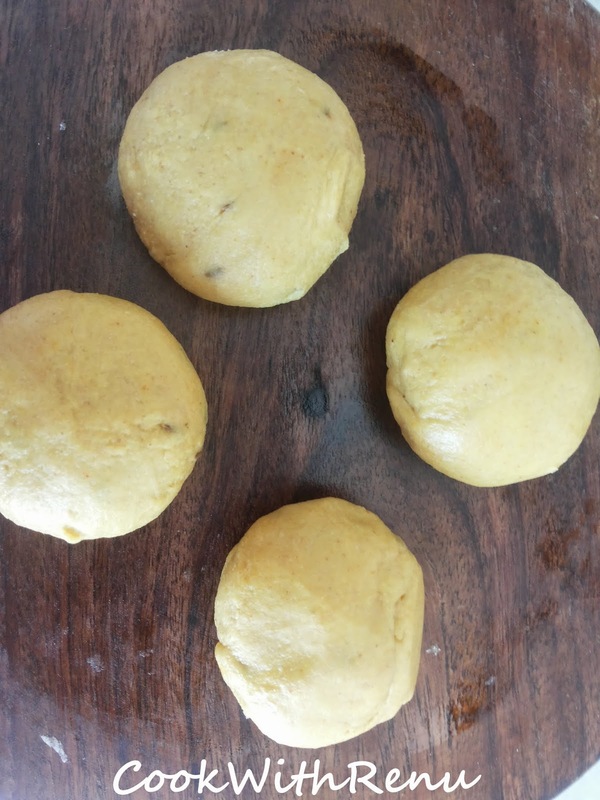 If the dough is soft, it is difficult to roll the puri’s. Once kneaded let the dough rest for 20-30 minutes minimum. One can make immediately too, but it is always a good idea to let the dough rest. In a kadai or deep bottom pan, add oil and let it start heating. In the mean time, roll the puri’s in around 3 inch diamter. Do use oil while rolling the puri’s. This helps in rolling. One can use dry flour (Ata) too, but I always use oil, the reason is , If we use flour, the oil gets dirty with the flour. This is the tip given by my mother. The puri’s should be rolled evenly to puff up. Check if the oil is hot, by inserting a tiny bit of flour in the oil. It should come up immediately. Once the oil is hot start frying the puri’s. Dip the puri in hot oil. Let it come up and then with the back of your spatula, slowly tap it. This helps in puffing the puri’s. Once puffed reverse it and let it cook on the other side. Some Puri’s might not get puffed. So reverse it if the underside is cooked. Once cooked remove it on an absorbent paper. Hot and yummy puri’s are ready. Serve it with Chole, Potato Bhaji, Kheer, Aloo Saag, etc. The possibilities are endless. It even goes well with tea. 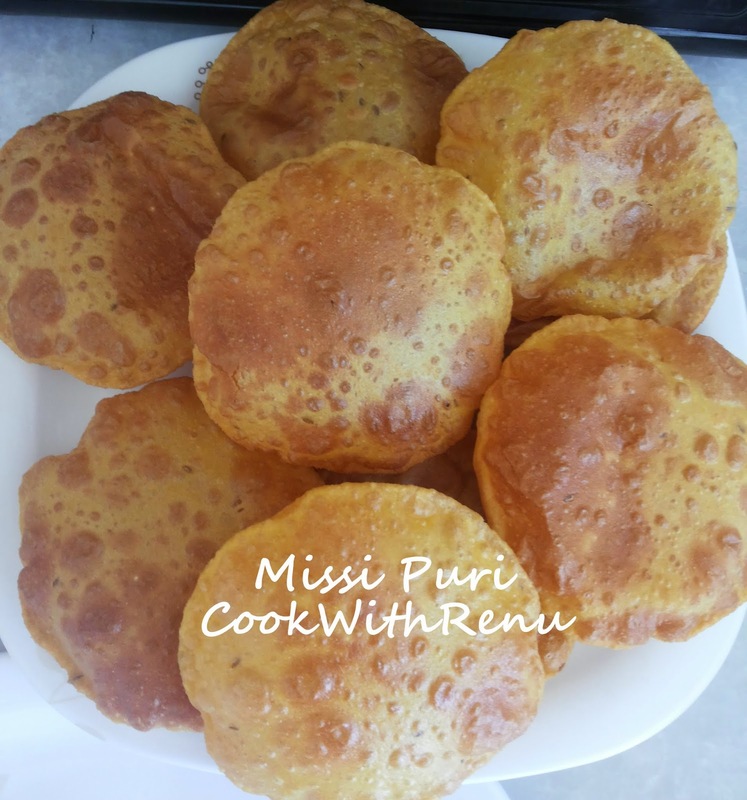 The masala puris look so yummy and nicely puffed up. I love to have them with masala chai. How puffy and super delicious those masala puri looks, just need a bowl of aloo masala to enjoy these puffy beauties, drooling here Renu. Wow, masala puri look sooo flavorful and delicious. Love the addition of cumin seeds in there. They look perfectly puffed up and inviting. Always love the masala pooris with raw mango pickle..yours look perfectly puffed up and so very tempting !! Hot masala puris, masala tea and some chundo, yummy. I love hot puris. I don't add chana flour, but will do so next time. Oh wow.. Loved the way it has puffed… beautifully made. Yum ! A perfect sunday breakfast. Infact I can eat this with only achaar and chai too. 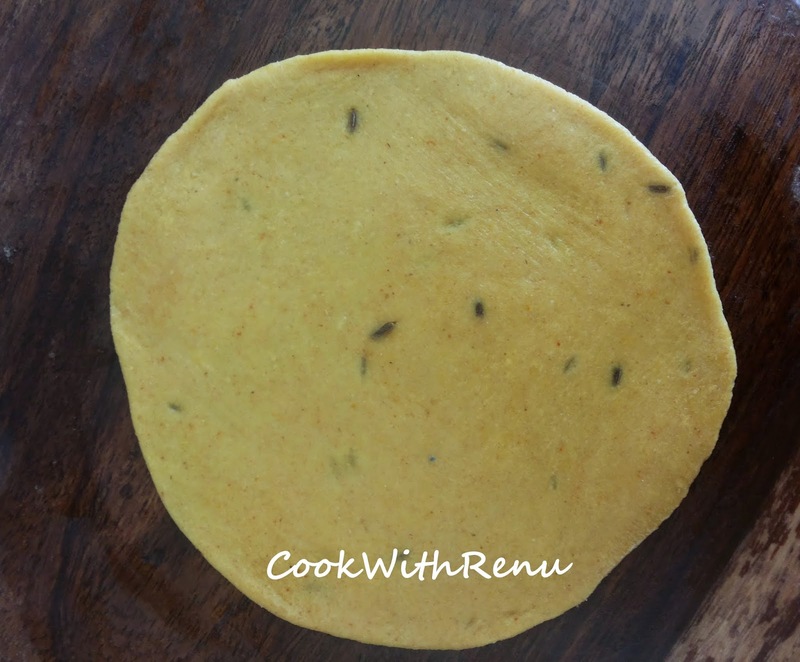 Masala puris are tasty and a favourite at home. You reminded me to make these. really reminded my days when I used to eat purimasala with pickle in breakfast.. taste so great.Tempting clicks. 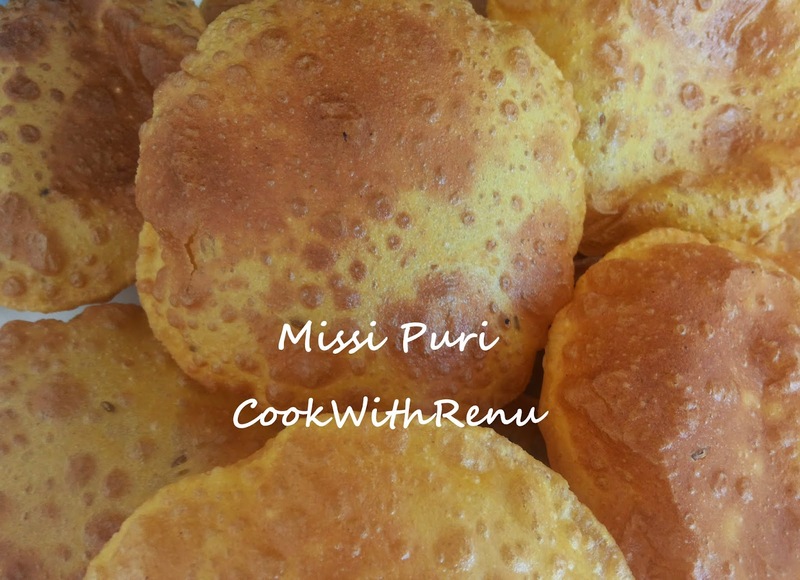 What a delicious looking fluffy missi masala puris, I can devour with masala chai and pickle.